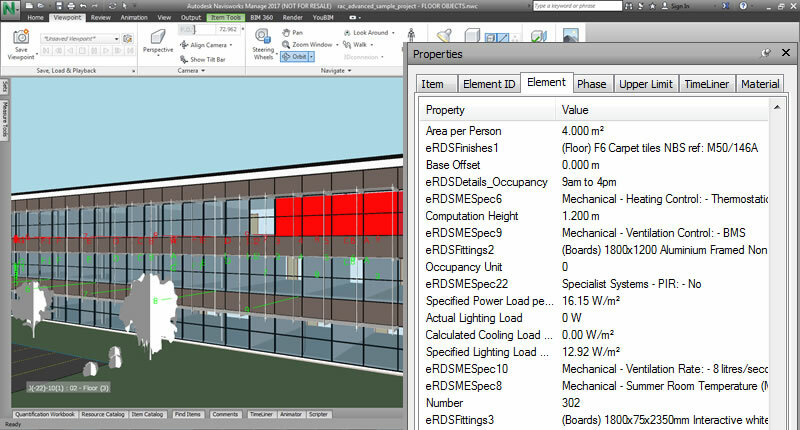 When using BIM and room data on a project the two sources of information need to match exactly. Our Revit Architectural plugin ensures this happens through a simplified workflow. Once downloaded the plugin will appear as a new tab on the Revit ribbon. 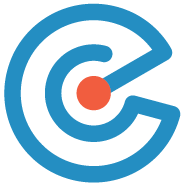 All the functions you need to export information to your room data project, and import completed information back into your model are available in one place. ONE FILE SETS UP eRDS CLOUD. 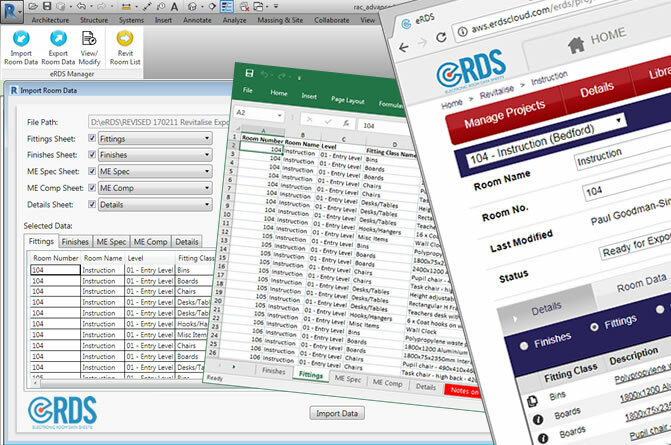 The plugin creates a Room List file from Revit which is saved and imported into eRDS Cloud. The process takes a couple of minutes and results in a new room data project with the same rooms, levels and information as in model. This organised workflow is the starting point for adding FFE to the project and ensures the Revit model and room data project are always in sync with each other. IMPORT ROOM DATA INTO REVIT. Completed room data defined in eRDS Cloud is ultimately imported back into the model so both information sources are synchronised. 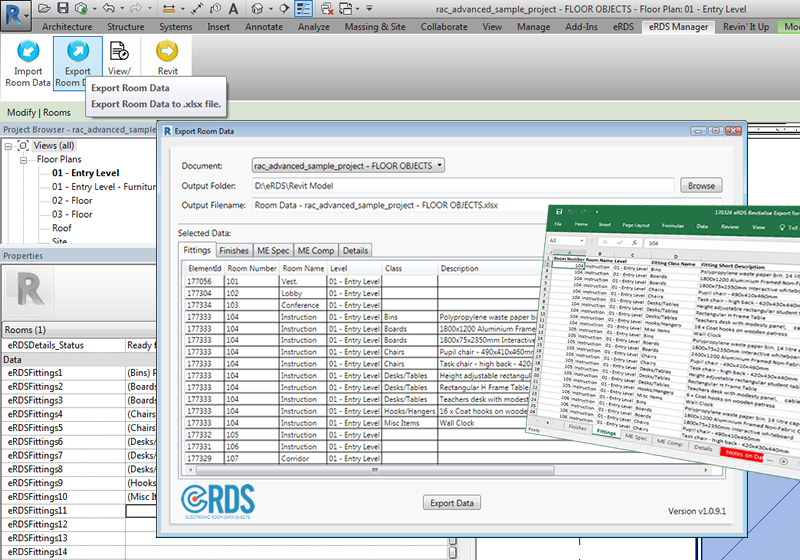 Room information from eRDS Cloud is exported to an excel file. The file has multiple tabs for the finishes, fittings, mechanical components and specifications and is imported into Revit in a single process. When the file is imported into Revit it writes the information as new parameters on the spaces and floors in the architectural model. Embedded room data in revit. 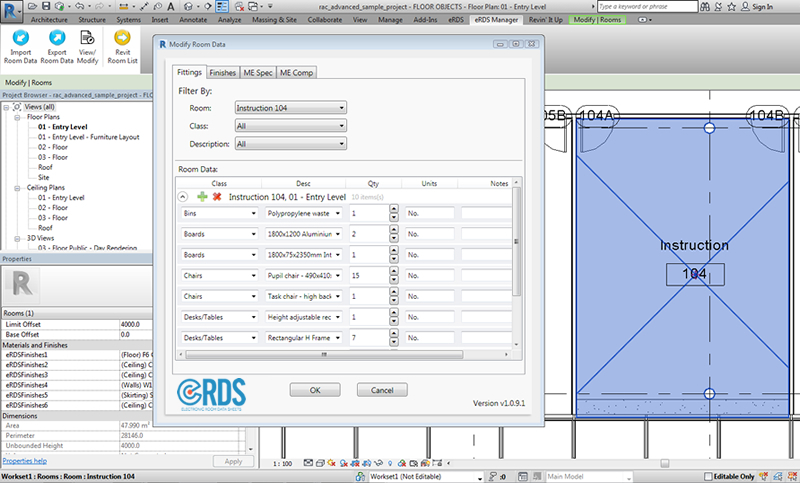 Because room data from eRDS is embedded in the BIM as Revit parameters it can be re-exported if necessary. This is a one-click process when done through the plugin which creates a multi-tab excel file containing all the information and the Revit Id’s. Alternatively, the room information can be extracted using standard Revit scheduling commands. And if the model is transferred to a third-party stakeholder, they can download our plugin and use it to make reports for all the finishes and FFE information direct from the model. EMBEDDED ROOM DATA IN BIM APPLICATIONS. 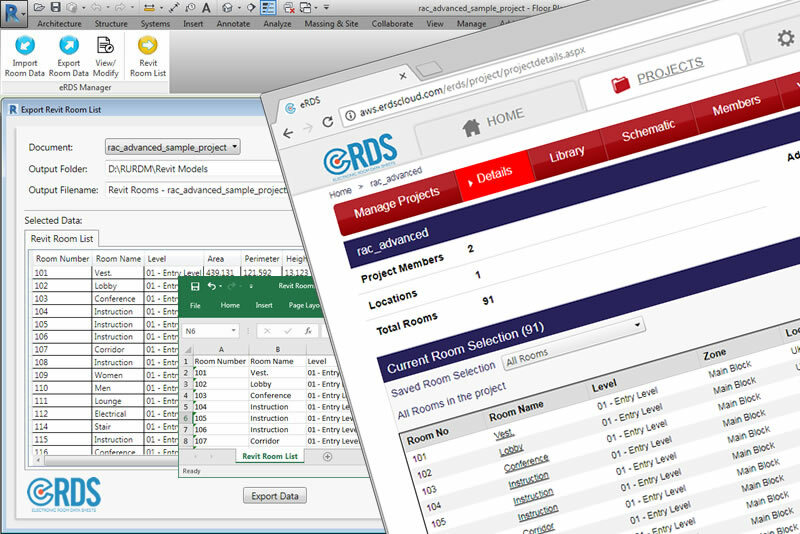 eRDS room data will be available in most BIM applications whether it’s for viewing such as in Navisworks, Autodesk 360, or in a variety of IFC viewers. 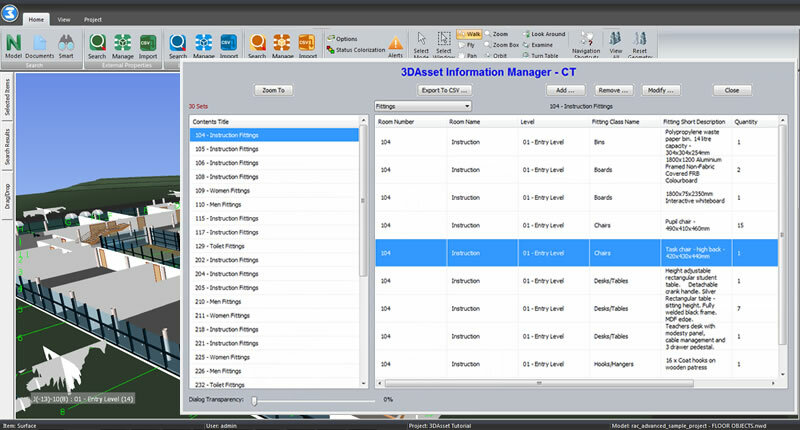 Your room data can also be used in FM and asset management applications such as 3D Asset and YouBIM. ROOM DATA BIM ANALYSIS IN 3DASSET. eRDS adds a significant body of information to each room. This can be used for all kinds of fit out processes using eRDS Field, and for colour coded BIM analysis in 3D Asset. Both these applications allow you to add further database properties for progress monitoring or data capture from site. All the information can be reviewed in context with the building and colour coded to produce compelling management reports. 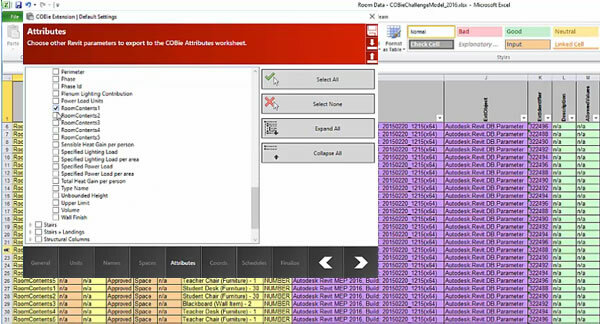 EXPORT ROOM DATA TO COBie. Once the eRDS room Information has been imported into Revit it’s embedded in the model. So when you export the model to COBie, all the room data is included in the spreadsheet ready for use in other workflows or software applications that make use of COBie. Click the link to download the plugin.